It's a unique handheld device called MelaFind. And it has to do with beautiful skin. And here at BeautyTipToday.com, that's what we are all about. Before we can put our makeup on, we need to know about our skin, and how to keep it healthy, and avoid melanoma. That's where the MelaFind System comes in. And we are very excited about this non-invasive skin care gadget. The FDA likes what it sees, and could issue MelaFind's approval for use in the United States by later this year. 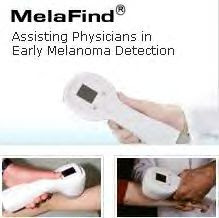 In layman's terms, what the MelaFind device does, is aid in the early detection of melanoma. Melanoma is the most serious type of skin cancer. And it all starts with a mole on your body and the changes that occur with its size, shape, or color. What this ground-breaking handheld device can do, is zero in on a mole with powerful wavelengths of light, snapping images that are connected to a computer screen that quickly determines a good mole from a bad mole. In other words, the MelaFind System results in far fewer lesion biopsies because of its amazing accuracy. If caught early, melanoma is 100% curable. To read more about the MelaFind System, designed by Electro-Optical Sciences, Inc., click here http://tiny.cc/0Vjle for an informative article by Brenda Jewel Glenn.